When was your last professional carpet cleaning service? Vacuuming will help remove visible surface soil and allergens, but the dirt embedded deep into the carpet fibers that cannot be removed by a vacuum, are the soils that shorten the life of your carpeting. Cleaning your carpets at least once a year is highly recommended if you want your carpeting to last its full life. We offer carpet cleaning specials that are affordable and efficient so you don’t have to break your back attempting to clean the carpets yourself. Reports in 2014 say that people pay anywhere from $43 to $60 per room for a professional carpet cleaning service. If you have 12 rooms in your home that can add up fast. We know that times are tuff, and the price of nearly everything are going up these days. Skipping your annual carpet cleaning service can put your family’s health at risk. That is why we offer pricing that is very affordable for any budget. On average we charge anywhere from $19.95 to $35 per room depending the square footage and soil levels of your carpeting. Our cleaning system is extremely effective in removing dirt, grime, allergens, and oils leaving no dirt attracting residues in your carpet so your cleanings last. 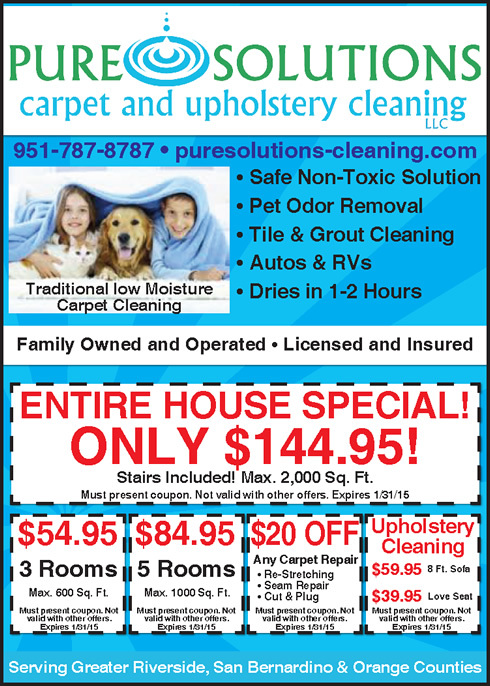 If you are interested in a professional carpet cleaning service that is extremely affordable and efficient, contact us today at 951-787-8787. Or you can submit your contact information below and a customer service representative will contact you shortly. Our service areas are Riverside, CA, and surrounding areas. We also service San Bernardino and Orange County.